"The Temple of Horus at Edfu will be opened for night visits as of the New Year. The move has been decided by Culture Minister Farouq Hosni after the completion of renovation works at the temple. Zahi Hawwas, Secretary General of the Supreme Council of Antiquities (SCA), said that most sophisticated lightening systems have been installed to allow night visits to the temple. Hawwas added that allowing night visits to the temple would help solve the problem of crowded tourists at the temple. It will also help ease crowdedness of tourist ships at the port of the temple, he added." The above link will take you to Ottar Vendel's Picture Odyssey from his recent visit to the Third Dynasty mastaba of Beit Khallaf. the Beit Khallaf mastabas K1 and K2 are situated on a low desert plateau 10 km west of Girga in Middle Egypt. and have produced remnants from the kings Djoser and Sanakht respectively. Ottar's site looks specifically at K1, and provides plans, diagrams, a satellite photo and various photographs of exterior views and some of the shafts. The images are large, but they did not take too long to load even on this very tedious dial-up connection. "Tempest in a teapot: Zahi Hawass' demand that the Art Museum return a mummy mask it acquired in good faith in 1998. Egypt's top antiquities official claims the mask was stolen and demanded its return within two weeks or else — seven months ago. Ownership disputes can take decades to resolve, but this demand seemed particularly empty, serving to get Hawass' name in the media — at which he is particularly good. : Zahi Hawass' demand that the Art Museum return a mummy mask it acquired in good faith in 1998. Egypt's top antiquities official claims the mask was stolen and demanded its return within two weeks or else — seven months ago. Ownership disputes can take decades to resolve, but this demand seemed particularly empty, serving to get Hawass' name in the media — at which he is particularly good." For some people, the exhibition of St Catherine's Monastery icons at the Getty is far more than an exhibition of art: "More than 60 religious groups, including some from Fresno, Texas and Minnesota, are scheduled to see — and in some cases venerate — the items lent by the Holy Monastery of St. Catherine in Egypt. Although the Getty remains just a snazzy art museum for other people, it is a holy place for the faithful. They are crossing themselves before the 750-year-old icon of Saint Theodosia and restraining themselves from kissing the plexiglass case holding a 1,500-year-old image of St. Peter the Apostle." Impressions of a multi-destination holiday which includes a quick visit to Egypt: "We trundled along the route of an old camel caravan trail through rocky mountains and dried river beds, known as wadis, for four hours. The green fields of the Nile flood plain then spread before us and led us to the splendour of Luxor, the world's biggest open-air museum where you step back more than 4,000 years into the land of the pharaohs. In the Valley of the Kings we marvelled at the brightly coloured hieroglyphics covering the tomb walls. And - in an extraordinary clash of ages - I found I had a full signal on my mobile phone just outside the entrance to the incredible tomb of the boy king Tutankhamun. Nearby was the equally awesome temple of female pharaoh Queen Hatshepsut. Carved into the foot of a 300ft cliff, the shrine has a panoramic view over the lush Nile banks where farmers with hoes were bent over cabbages, carrots, sugar cane and potatoes. After lunch at a five-star hotel (included in the day-trip price) we saw that the best had been saved for last - the jaw-dropping Karnak Temple which was once the most holy place in Egypt." See the above for the full account of the tour. "Despite a biting cold, the Grand Palais in the heart of Paris was bustling with visitors during this holiday season who came to see Egypt's Sunken Treasure Exhibition that was opened here on December 9 by Egyptian and French Presidents Hosni Mubarak and Jacques Chirac, respectively. People of all ages lined up in queues to explore the amazing treasures depicting artefacts coming from the lost city of Herakleion and parts of the city of Canopus." Some of the cultural highlights from Egypt from 2006, including a summary of Sunken Treasures of Egypt and an obituary for Naguib Mahfouz, amongst others. "There is an old Egyptian proverb: 'Do not rejoice over what has not yet happened.' Predictably, chump that I am, I'm sitting in the First Residence Four Seasons Hotel in Cairo, eating white chocolates and rejoicing prematurely. For, in the morning, I am to embark on a four-night Nile cruise. . . . We see two small ruins, one dedicated to Horus, the falcon-headed god and one to Sobek, the crocodile deity. We look at some mummified baby crocodiles. . . . Day four involves what the two single ladies call "the death march". Luxor: The Valley of the Kings and the Temple of Karnak – but why is every tomb the same? And where is the airconditioning?" The main feature of this particular article is not the information in the text, but the presence of a photograph of the carving. Click on the image to see an enlargement. "The National Democratic Party's announcement a month ago that Egypt is seeking to revive its nuclear programme and means to build a large power station neighbouring the Graeco-Roman site of Tel Al-Dabaa on the Alexandria-Marsa- Matrouh road caught the headlines of newspapers and sparked uproar among archaeologists who feared the construction would destroy a major archaeological site. Conflict also arose between the Supreme Council of Antiquities (SCA) and the Ministry of Electricity which will lead the construction process. The press has weighed in daily to offer a plethora of contradictory opinions, leaving the public confused as to the genuine issues. Rumours have spread that the conflict has been deliberately created by the SCA and the ministries of tourism and construction in an attempt to ensure another location is found for the nuclear station and Tel Al-Dabaa is left free for abuse by a mega tourist project like the huge complex at Marina Al-Alamein. Last Monday, however, a committee of SCA experts and Ministry of Electricity officials embarked on an inspection tour of the 70 sq km site of Tel Al-Dabaa and finally came up with concrete ideas to suit all parties." See the above item for the full story. Just to let everyone know that I am off again for a week or so, and will update when I return, if not before. There is a report on the 1st annual Quarryscape workshop, which took place in October 2006. Cities are continually built and rebuilt in layer upon layer, much of which is invisible. We've heard of the catacombs of Rome and Paris and have seen or read about the Temple of Mithras, an important Roman ruin discovered on Walbrook Street in London during rebuilding work after World War II. Archaeologists know about the cities under cities that can be found by digging, and the growing ranks of urban explorers use spelunking skills and equipment to visit often off-limits or hidden, underground city sites. If these topics fascinate you, then a new book, Beneath the Metropolis: The Secret Lives of Cities (2006, $29.95, Carroll & Graf) by Alex Marshall should be right up your alley." The book looks at many different cities, but also considers "Polluted sands rotting away the foundations of Cairo". The blog includes an introduction to the goddess Mut and to the work carried out by the team, and promises updates for 2007 from mid January. Terrific! "Egypt's most important sites are experiencing major trouble, a new report suggests. All the three reviewed Egyptian World Heritage sites were in danger of losing the values that originally brought them into the prestigious Unesco list, and they were worst rated in the Middle East and North Africa region. 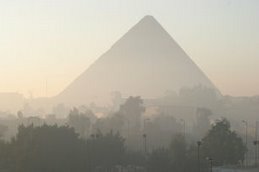 The threatened sites include the Pyramids of Giza, the Islamic district of Cairo and the historic cities of Thebes and Luxor. In a review of 94 major World Heritage sites made by the George Washington University in cooperation with the 'National Geographic' journal, the major historic and tourist attractions of Egypt are all among the bottom-25 of the list, receiving from 50 to 58 out of 100 possible points." This summary provides many more details - it is highlighting a very important report - do have a look. "When dentist Ng Tze-chuen is not picking at cavities at his Causeway Bay clinic, he may be dreaming about his forceps and the craters in a distant moon, wrecked titanic boats in the deep ocean and pharaohs' chambers hidden in the Egyptian pyramids. It was back in the early 1970s when Ng tried to pick up an inlay with his surgical forceps to fill cavities, but dropped it on the floor. An idea flashed across when the apple, or the inlay in this case, dropped. how nice it would be, he thought, to have surgical forceps - as flexible and gentle as the human fingers - to feel the object and adapt its grip according to the shapes of inlays. He brought the concept to have it custom-made by top engineers at Polytechnic University. The Holinser Forceps was developed for use by dentists with self-adaptive grip to hold inlays and insert them into cavities. But Ng aimed higher. . . . After 30 years, Ng's forceps concept has traveled an amazing journey from the surgery room to outer space, to deep-water archeological sites and back in time with the Egyptians in Giza." See the full story for how the idea evolved and was used in many different environments for very different purposes. "In partially solving a mystery that has baffled archeologists for centuries, a Drexel University professor has determined that the Great Pyramids of Giza were constructed with a combination of not only carved stones but the first blocks of limestone-based concrete cast by any civilization." "The SCA on Tuesday called for implementing an archaeological project on restoring 950 Pharaonic tombs that were sculptured at the foot of El-Qarna Mountain on the Western Bank of Luxor to immortalise kings and other royalty of Ancient Egypt. The project will be carried out through foreign grants to be raised by an international fund on overhauling monuments in Luxor within the framework of the Comprehensive Development for the City of Luxor project (CDCL). Luxor's Supreme Council Chairman Samir Farag said that the project would be carried out in cooperation with the UN Development Programme (UNDP), under the aegis of Mrs. Suzanne Mubarak." "After 24 years of research, Harkless presents a comprehensive history of the great forgotten civilizations of Africa. . . . . The rich history of this culture began in 2500 B.C. with the kingdom of Kerma. Harkless tracks its origins as well as its thriving success through 750 B.C., when the Nubian Pharaohs conquered Egypt. They ruled for 100 years until the Assyrians conquered Egypt and forced them to retreat to their Kingdom of Napatan. Harkless shares their complete history through the Meroe, the last empire of the Kush. The Meroitic dynasties reigned for 40 generations as a people separate from Egyptian culture, developing their own language and script. Through research of recent archaeological campaigns, including the investigations of more than 200 pyramids and cemeteries, Harkless shares new information about the architecture, art and politics of the civilization. Many of their accomplishments surpassed those of Egypt"
"The Walters Art Museum presents the exhibit Daily Magic in Ancient Egypt through November 18, 2007. Magic played an important role in religions of the ancient world. Amulets in particular were believed to posess great power to bring protection, health, luck, and even immortality through their images and symbols. This small exhibition will feature 46 amulets, scarabs, figurines, and ritual objects associated with this belief in the power of magic in ancient Egypt. The art and history of the ancient world comes alive in one of the Walters Art Museum’s best-loved collections, which comprises amazing treasures from ancient Egypt, Nubia, Greece, Rome, Etruria, and the Near East. The Walters’ collection is one of the largest and finest assemblages of ancient art in the United States. " This piece is accompanied by a beautiful photograph of a 700BC collar with lioness head in gold. The looting of antiquities has a history as old as the anqituities themselves, but political instability and rising prices have seen a surge in thefts in recent years. Everyone who emailed and commented re my recent illness - you made me feel so much better. Again, thanks so much to everyone for all your good wishes re my recent health problems. I received a phonecall from the hospital yesterday to say that the latest test results show improvement, and I can remain out of hospital for the moment - no more dialysis, no more hosptial beds, no more hospital food!! As a thank-you to all of you, I've put together a little website - a collection of around 45 photographs taken in November 2006 of artefacts in the new Imhotep Museum at Saqqara. It is at www.imhotep.cd2.com. I hope that it gives some of you some pleasure. I have updated the blog with backdated news items, back to December 7th. Hopefully I haven't missed anything too important. It would have been well nigh impossible without the help of Kat Newkirk. I will probably be going away for a week or so to recuperate, and may not have access to the Net - but if I do abandon the blog for a period I will let you know in advance. "Experts suspect many mummies have simply become disoriented and wandered off their usual migratory paths, while others are thought to be doggedly pursuing trespassers who disturbed their sanctuaries, even as the foreign visitors return to their home countries thousands of miles away. Most conservation groups, however, stress that Egyptians should focus on preserving the mummies that still remain, though recent efforts to increase their numbers by breeding them in captivity have failed, since mummies are dead and therefore cannot reproduce." See the above page for the full, wonderfully improbable story. Jane Akshar has been so busy whilst I've been away that it is difficult to know where to start! Here are some recent important headings that are to be found on the above address - do go and have a look! "The Coptic monastery known as Deir Al-Surian, or the Monastery of the Syrians, contains more than 3,000 books as well as a vast number of texts in Syriac, Aramaic (the language of Christ), Coptic, Arabic and Ethiopic. They date upwards from the fifth century and today, as a result of the revival in Coptic monasticism in recent years, a new generation of educated monks are anxious to safeguard this heritage. Both Syrian and Coptic monks are engaged in their conservation, as well as restoration of the monastery itself. Collaborating with them on what is known as the Deir Al-Surian Library Project is the Levantine Foundation." The latest issue of the BAR includes an article entitled Out of Egypt by James K. Hoffmeier: "Based on archaeological evidence, how likely is it that Israelites were enslaved in Egypt? And if they were there, which way did they go when they left? Recent archaeological excavations in Egypt shed new light on their time as Pharaoh’s slaves, the locations mentioned in Exodus and the route the Israelites took out of Egypt to the Promised Land." "Discovering Tutankhamun: The Photographs of Harry Burton creates a visual first-person narrative of one of modernity's greatest archeological finds. This exhibit gives viewers the feeling they're standing with art photographer Harry Burton as he chronicles the exploration and discoveries of more than 5,000 objects from Tut's tomb in a series of quiet, and often stunningly beautiful photographs. A better than usual travel piece about visiting Egypt and what to expect at different sites, from a writer who took the time in advance to read up about the sites he was to visit. He considers in brief everything from individual monuments to shopping in Aswan and environmental damage caused by the Aswan dam: "From Cairo it was a short flight down to the First Cataract, otherwise the setting for Agatha Christie's Death on the Nile and, more prosaically, the site of the giant Aswan Dam. The Egyptians are immensely proud of the dam, but even they admit to the negative, long-term environmental consequences. Without the annual Nile flood, the water table is changing downstream and corrosive salts are now eating into the very fabric of the Nile temples. The Mediterranean has also been deprived of its traditional source of fresh water, which has helped turn that great sea into a cesspool. In ancient times, Aswan was the true border of Egypt. Southwards lay the mysterious and unknown source of the Nile itself. Ramesses the Great extended Egyptian control a lot further south to what is now the border with fratricidal Sudan." Exhibition: Tutankhamun at London's Dome? "The Egyptologist is chock full of clues and experienced mystery readers will pick up on them readily and be perfectly correct in his or her assumptions. That fact does not make is book any less enjoyable. The narration and language associated with each of the major characters makes this audio book a must-listen." This is a very swift and apologetic message to let you all know that I am still here. I have been in hospital for some time. I was admitted to intensive care at St Thomas's Hospital in London UK at the beginning of December with gall bladder, pancreas, liver and kidney failure. Gall bladder, pancreas and liver are now recovering nicely. However, for the last week, my kidneys have still not been operational, and I have been on dialysis. I returned home yesterday for the first time, just for a break until Sunday, tomorow. On Sunday, depending on the results of blood tests, I may be allowed to return home for two weeks, which is what my medical advisors are hoping, but I also have to accept that I may be re-admitted. I am not sure when it will be possible to resume the blog on a daily basis, but I will attempt to bring it back together over the next couple of weeks. I am sorry for leaving things in a state of limbo - I was taken ill very suddenly, and it is remarkably difficult to arrange anything from an intensive care ward! My inbox is the scariest thing I have seen since I saw the inside of my gall bladder on the ultrasound, so please bear with me if you are waiting for a reply to an email! I promise to get through the messages eventually. Thanks so much for all the messages of concern, and all the Christmas cards. I am feeling much better, and will be in touch properly soon. Temples and Tombs is open at the Cummer Museum from 22nd December 2006 until 18th March 2007. "The Cummer Museum of Art & Gardens has been preparing for Temples and Tombs: Treasures of Egyptian Art from The British Museum for over a year. A lot of planning had to go into bringing an exhibit of such stature to Jacksonville. Then, the Cummer Museum had to ensure the construction of the new Central Gallery would be complete in time for the opening of the exhibit. Finally, staff from the Cummer and The British Museum, including Spencer, had to carve out two weeks to prepare the gallery for the museum members’ opening tonight. Spencer said he and two of his colleagues from The British Museum spent 12 days in Jacksonville to prepare the gallery and bring in the artifacts." There are a few black and white photographs at the end of the article. Thanks to Mary Beard for highlighting her piece on the above URL, an un-watered down travel account, from which an extract is as follows: "If you venture deep inside the pyramids (as I did the day after the fun at the zoo) you find that the inner chamber smells very strongly of piss. It’s a predictable act of desecration, I guess. But it does tend to encourage a speedy visitor turn-around. In general, though, the pyramids sprang lots of surprises. And they offered the possibility of pleasures (or transgressions) that would be decidedly off limits back home. Let me say to begin with, unlike so many “Wonders of the World,” they do not disappoint. They are absolutely vast and, at least if you view them one direction, they give every impression of being isolated in the trackless desert." See the above page on Mary Beard's blog for the full story, plus reader comments in response. "Strange specimens of natural glass found in the Egyptian desert are products of a meteorite slamming into Earth between 100,000 and 200,000 years ago, scientists have concluded. The glass—known locally as Dakhla glass—represents the first clear evidence of a meteorite striking an area populated by humans. At the time of the impact, the Dakhla Oasis, located in the western part of modern-day Egypt, resembled the African savanna and was inhabited by early humans, according to archaeological evidence"
Thanks to Thierry Benderitter for the information that Osirisnet has het again been updated with some excellent new pages: For the first time in a hundred years, there is a full coverage of the whole D64 mastaba of Akhet-hotep and Ptah-hotep, over three pages with colour photos. "More than one million tickets have been sold for The Field Museum's blockbuster exhibition Tutankhamun and the Golden Age of the Pharaohs. The exhibition opened May 26, 2006 and will continue through January 1, 2007. Due to Tut's vast popularity, The Field Museum has extended the hours of operation to accommodate the public. The Museum has opened one hour earlier -- at 8 a.m. -- throughout December, and closes at 11 p.m. on select days." See the above press release for more. "Egypt announced the discovery of a carving dating back to the 12th century BC which could hold the key to valuable information on Karnak temple, the largest ancient religious site in the world. The large quartzite stone, carved with 17 lines of hieroglyphics, highlights the achievements of high priest Bak En Khonso and his contributions to the grand hall at Karnak. The 170 cm by 80 cm carving (5.5 by 2.5 feet), unearthed by a team of archeologists in the southern Nile city of Luxor, also depicts the high priest's family tree." See the above for more, including comments by Zahi Hawass. "Agricultural activities by local farmers near the world heritage site of Pasargadae last year resulted in the accidental discovery of a big stone slab bearing some carvings typical of Pasargadae monuments. The discovered slab was recently proved by archeologists to have been the entrance gate to the mausoleum of Cambyses II, son and successor of Cyrus the Great, founder of the Achameneid Empire (550-330 BC). . . .
During his reign, Cambyses continued the politic of expansion started by his father. First, he took part with his father to the conquest of Babylonia and was named King of Babylon after he captured the city in 539. After rising to the throne, he invaded Egypt in 525 BC, putting an end to the 26th Dynasty of the Pharaohs and beginning a period of Persian rule that covered much of the next two centuries. Cambyses later personally led a force up the Nile to conquer Ethiopia, but after annexing the north of the country, he ran short of supplies and had to return. While on his way back from Egypt with his army in 522 BC, Cambyses was assassinated upon order of one of his brothers, Smerdis, which he himself tried to have assassinated. At his death, after a short period during which Smerdis assumed the leadership, more palace struggles led to the rise to the throne of Darius the Great, whose task was to organize such a vast empire." Critical article looking at the move of the inhabitants of the archaeologically important land of el Qurna to a new location, to enable the land beneath their homes to be excavated: "Comprising four interconnected nogou' (hamlets) -- Al-Hurubat, Atiyat, Al-Ghabat, Al-Hasasna -- the village conglomerate of Gurna is the most densely populated part of the west bank of the Nile in Luxor -- the site of the Theban necropolis. And evacuating it has proved to be a major undertaking, second only to evacuating Nubia prior to its submersion in Lake Nasser in the course of building the Aswan High Dam." See the above article for more information. "The exhibition features some 500 spectacular objects that sank when geomorphic changes caused Egypt's North Coast to submerge between 600 and 800 AD. They have been rediscovered over the past decade by an underwater team led by French marine archaeologist Franck Goddio. The Grand Palais, which was built early in the last century and houses art exhibitions from all over the world, combines an imposing classical limestone façade with a riot of Art Nouveau glass and ironwork. In 1993 one of the glass ceiling panels fell and the building was closed for 12 years so extensive restoration could be carried out. It reopened in 2005. Goddio, with the support of the Hilti Foundation, explored the shallows off Alexandria and Abu Qir, retracing the last centuries of ancient Egypt in the Late Kingdom and under the Ptolemies, through the Roman and Christian periods, the advent of Islam, and even the French fleet which sunk in the Battle of the Nile in 1798." "Egypt's Sunken Treasures features colossuses of pink granite, a 17.6-ton slab inscribed with hieroglyphics, a phalanx of crouching sphinx, pottery, amulets and gold coins and jewelry - all painstakingly fished out of the Mediterranean. Some of the oldest artifacts are estimated to have spent 2,000 years underwater. The show, which runs through mid-March, spans more than 1,500 years of Egyptian history and traces the decline of the Pharaohs and occupations by Greeks, Romans and Byzantines." The exhibition opened in Paris on 9th December 2006 and runs until 16th March 2007. It was visited by more than 450,000 visitors at its first stop in Berlin. A review of some of the more conspicuous examples of antiquities smuggling and related controversies: "There appears to be an insatiable desire, especially in the wealthier countries of the developed world, for archaeological relics -- both among private collectors and certain unscrupulous public institutions. While demand remains high, all attempts on both a national and international level to contain and reduce the trade seem ultimately doomed to failure." A bit of fun from CNN: "Following news that archaeologists in Rome have discovered a sarcophagus containing what they believe to be the mortal remains of St. Paul the Apostle, we offer a few tips on how to get in on the world of excavation. . . . Excavators these days are far more likely to be armed with a theodolite and laptop than a whip and pistol, so if you are working on the assumption that archaeology = glamour you're going to be sorely disappointed. Mind you, if you find yourself digging somewhere hot then an Indiana Jones Fedora might come in useful." See the above for more worldly advice . . .
Egyptian Antiquities from the Louvre is a major new international exhibition opening at the Art Gallery of South Australia in March. This video offers historical background information about the Egyptian afterlife, with lovely footage. "In a few weeks, beginning in February, King Tut will debut at the Franklin Institute in Philadelphia. ARCHAEOLOGY's Tracy Spurrier spoke to Zahi Hawass, Secretary General of Egypt's Supreme Council of Antiquities, and curator David Silverman of the University of Pennsylvania Museum of Archaeology and Anthropology about how the exhibition was brought together." See the above page for details of both interviews. "British police are investigating the role of one of the country’s biggest construction firms in what was originally a £71m contract to rebuild the Great Library of Alexandria, one of the wonders of the ancient world. The Serious Fraud Office (SFO) has interviewed several employees of Balfour Beatty over their role in the contract in Egypt to build one of the architectural jewels of the Middle East. A Unesco world heritage site, the modern Bibliotheca Alexandrina, on the shores of the Mediterranean, was completed in 2001. The library and cultural centre was designed to commemorate the original library, whose loss in antiquity was said to have changed the course of western civilisation. Sources close to the inquiry said detectives were focusing on why the fixed-price contract issued by the Egyptian education ministry apparently rose by more than £50m after the work was commissioned." This is an interesting project to look at supplying 3D images of archaeological sites, including the Great Pyramid at Giza and the Temple of Khons, enabling visitors to use online buttons, the arrow keys and the CTRL key to navigate around the sites. Definately worth a look. "Since the 1960s and ‘70s, libraries in the West have been digitizing their catalogues and even the contents of their shelves, but a lack of resources has kept all but the most well funded Middle Eastern libraries from doing the same. The Yale University Library hopes to correct this situation, bringing the fruits of Middle Eastern scholars’ labors into the digital age." The Library is also looking at working with the Egyptian National Library and Archives (ENLA) to bring its materials into the first phase of the project, the Online Access for Consolidated Information about Serials (OACIS) - a searchable list of catalogue information compiled from the 20 participating libraries around the world, including the Bibliotheca Alexandrina (BA) and that of the American University in Cairo. "After clamping down on tour buses in an attempt to save what remains of the Step Pyramid, SCA director Zahi Hawass launches a concerted campaign to stop damage to the nation’s antiquities." Thanks very much to Ingeborg Waanders who had forwarded me details of a new and interesting project set up and run by his friend Niek. The project, called Shabticollections.com, has been set up partly to provide an on-line database of privately owned shabtis. Musem-pieces are usually well catalogued and published, but the ones in private collections tend to stay below the radar. In an effort to do something about it, Niek has set up a database where people can anonymously post and publish their shabtis, making the data available to scholars and the public who may find the data of considerable use. There is also a commercial aspect to this site, which visitors should assess for themselves. "While many New Yorkers were hunting for bargains in the pre-Christmas sales Thursday, one anonymous buyer opted for a more unusual purchase, picking up a 3,000-year-old mummy at auction. The unnamed, private collector paid $1.1 million for the ancient Egyptian sarcophagus, believed to date from 990 to 940 BC. . . . Christie's did not say what the unidentified buyer intended to do with his new purchase." Sorry Kat - I know how you feel about this one! "Minister of Tourism Zohir Garana said that the ministry is now coordinating with the ministries concerned to re-operate Nile cruises between Cairo and Aswan." The Egyptian Minister of tourism , who visited China last month, said that his visit to Beijing aimed at activating the China's decision to add Egypt to the list of the major travel destinations for Chinese tourists. According to a report by the World Tourism Organization (WTO) on the reason that the Chinese market has become one of the great expectations of tourism industry worldwide, China would produce 100 million outbound tourists by 2020. Egypt is seeking to attract at least one million Chinese tourists, said Garana. Zahi Hawass talking about working with Mrs Mubarak on the new children's museum. Nice news about Dederah Temple, the first one I ever visited on the Nile: "Opposite the Upper Egyptian city of Qena on the west bank of the Nile stands Dendara Temple, a massive pile of awe-inspiring ancient Egyptian and Graeco-Roman architecture. Over the past two years the Supreme Council of Antiquities (SCA) has carried out a reconstruction and development programme of the entire temple area, and now the tourist-friendly site is open to visitors. However, interest in it was low, and a few years ago the temple was closed to visitors and its cafeteria and gift shops were almost derelict. Now the SCA's site management policy to rescue Egypt's archaeological sites and make them more tourist-friendly has brought new life to Dendara. The temple has been resurrected not only as an ancient temple but a comprehensive tourist complex providing visitors with various cultural and entertainment facilities." "Archaeologists are sizing up a splendid painted anthropoid wooden sarcophagus found by chance at the Saqqara necropolis last week.. The sarcophagus was found by an Egyptian archaeological mission engaged in cleaning the burial shaft of the sixth- dynasty royal physician Qar, which neighbours King Djoser's pyramid complex at Saqqara almost 35km south of the Giza Plateau. The team, which is led by Zahi Hawass, secretary-general of the Supreme Council of Antiquities (SCA), was taken by surprise when they stumbled upon the beautifully-painted anthropoid coffin. The covering featured a bearded man with a reddish brown face and large, open eyes lined with black kohl, thick eyebrows and red lips. His garment is painted dark blue and embellished by a collar with three rows of blue, green and yellow cylindrical beads and a pendant adorned with a figure of Maat, the goddess of justice, stretching her wings in a way that enables her to hold both sides of the lid." See the above page for the full story and a lovely photograph. "Bruce Trigger was a leading expert in three distinct fields of archaeology: as a historian of the discipline; as an Egyptologist; and as an authority on the aboriginal cultures of ancient North America. He placed archaeology as an academic discipline and a practice within a broader context of social and cultural evolution. As a historian of his discipline, Trigger was best known for his monumental History of Archaeological Thought, published by Cambridge University Press in 1989; the 2006 revised edition, which appeared just before his final illness, was in many ways a new book." See the above page for the rest of the article. "Culture Minister Giorgos Voulgarakis called on the United Nations yesterday to adopt a resolution that antiquities be returned to their country of origin . . . . 'The illegal trade of antiquities is in the same category as the illegal trade of weapons, narcotics and people. It amounts to a form of organized crime that is directly related to mobsters and money laundering,' the minister said while addressing a plenary session of the UN General Assembly in New York.. . . The draft resolution, submitted by Greece, was approved by the assembly." This is the point from which I have updated the blog with backdated news items, from 7th December to 24th December, the period when I was in hospital. here's hoping that I haven't msised anything important! "Egyptian archaeologists have discovered the funerary remains of a doctor who lived more than 4,000 years ago, including his mummy, sarcophagus and bronze surgical instruments. The upper part of the tomb was discovered in 2000 at Saqqara, 20 km (12 miles) south of Cairo, and the sarcophagus came to light in the burial pit during cleaning work, state news agency MENA said on Tuesday, quoting Egyptian government antiquities chief Zahi Hawass. The doctor, whose name was Qar, lived under the 6th dynasty and built his tomb near Egypt's first pyramid. The 6th dynasty ruled from about 2350 to 2180 BC." For those of you who are interested, I've put back up two of my websites. I'll be working on the Predynastic photo gallery over the next couple of weeks. Jane Akshar has reported that the overgrown vegetation at the temple of Seti I has now been cleared, but also points to the damage already done by the plant growth, and the ongoing water damage. See the above page for photographs that demonstrate her points. "An Egyptian farmer found under his residence an over 3,000-year old temple with important inscriptions and drawings from that time, belonging to the New Kingdom (1539-1075 BC). The site, in the locality of Sohag, 500 kilometers south of Cairo, was found six meters deep in a place where it is thought that there are other temples of pharaohs of the 18th and 19th centuries. Archeologists continue with excavations to find new buildings devoted to divinities Anoris and Miht of the New Kingdom." This is the entire item on the Plenglish website. "As the importance of cultural patrimony increases, American museums will probably never again be able to acquire Greek, Roman, and Egyptian works at the rate and with the freedom they did in the late-19th and early-20th centuries, when major collections, like those of the Metropolitan Museum, were assembled.In different ways, two events in New York this month –– a sale on Thursday at Christie's, and an exhibition opening in two weeks at the Met –– offer reminders of that time, an exciting one for archaeologists, collectors, and curators, when some of the most important discoveries of Egyptian art were made." This somewhat less than informative piece suggests that Russian archaeologists working in the Giza vicinity have made some new discoveries, including two tombs found with the help of "geo-radar" and 15 artefacts. See the above URL for the brief item. Jane Akshar has summarized a recent lecture at the mummification museum. The lecture, delivered by Francisco J Martin Valentin on 3rd December 2003, focused on the Senenmut Project: "TT353, the tomb of Senenmut was discovered by Herbert Winlock in Jan 1927 and its most unique and special feature is the astronomical ceiling, the oldest in the world and in the opinion of Valentin as special as the Sistine chapel." See the above page for her complete notes. A brief report quoting Zahi Hawass sounding off on 3rd December about the theory that some form of concrete was used in the building of the Giza pyramids. He describes the theory as an "insult". An article looking at many of the world's most important herigate sites, including the west bank sites of Luxor, and the damage being imposed upon them by human activities and tourism. "Proximity to the Valley of the Kings on the west bank of Luxor has put most Qarna villagers into the tourism business: sculpting, alabaster shops, selling ancient Egyptian replicas, renting bikes or hawking souvenirs. But as Luxor authorities decided to relocate families by the hundreds to a new community to protect the monuments on which the village was literally built more than 100 years old, unrest marred the peaceful village. People seemed reluctant to leave - preferring their primitive village, lacking clean water and sewage, to the new, modern flats built for them. The new city has service centres, a post office, a police station, a cultural centre, electricity, running water, sewage, a mosque, schools, gardens and a market. But the presence of more services was of little interest to many, especially those from the younger generation. Some said that they hated leaving behind their 100-year-old homes - considered by some as family heritage, old and crumbling as they are." Interesting piece which may have implications for the use of images by researchers in art and heritage fields: "In a move which could transform art publishing, the Victoria and Albert Museum in London (V&A) is to drop charges for the reproduction of images in scholarly books and magazines. Reproduction costs now often make it difficult to publish specialist art historical material. The new scheme will come into effect early next year.The V&A is believed to be the first museum anywhere in the world which is to offer images free of copyright and administrative charges. It also intends to take a “liberal” view on what should be deemed scholarly or educational. The new arrangements will normally apply to all books published by university presses. Free images will also be available for exhibition catalogues and journals such as Apollo and The Burlington." Bruce Trigger died on Friday at the age of 69 after a long period of illness. "An Egyptian-Polish archaeological mission discovered a large collection of pottery fragments, pieces of car tonnage and parts of the priest Bani-mesu's sarcophagus while excavating at Queen Hatshepsut's temple at Deir el-Bahari on Luxor's west bank. Numerous pieces of ostraca, pottery, ushabti figurines, papyri written in Coptic and fragments of a nemes headdress of king Thutmose III have also been unearthed. The teàm also continued its programme of restoring, documenting, and drawing of the New Kingdom shrines on the third terrace of Deir el-Bahari, including those of Thutmose III, Queen Hatshepsut, and the northern and southern shrines of Amun-Re." There are early reports that Bruce Trigger has died. Bruce Trigger has helped to explain in the clearest terms how archaeology had developed, and the consequences that this has had for the field as a whole, but he has also participated in the development of archaeological thinking itself, exploring new ideas and offering different approaches. An informal tribute to him can be found at the above site. One of his important contributions to Egyptology was the Predynastic chapter of Ancient Egypt: A Social History, with B.J. Kemp, D. O'Connor, and A.B. Lloyd (Cambridge University Press 1983). Another was the comparative study Understanding Early Civilizations (Cambridge University Press 2003). "The government began trying to get the families to leave after World War II, but talks repeatedly bogged down. Many residents, who depend on Luxor's tourist business to earn livings, argued that new homes being offered were too small and didn't come with new jobs.Over time, though, many grew tired of the standoff.In an effort to preserve the ancient tombs, authorities prohibited the homeowners from adding to their residences or installing modern plumbing, which forced people to bring water uphill using donkeys.Many people expressed happiness with the government's latest offer, which includes giving residents either new homes or plots of land in the complex that will include a market, police station, cultural center and schools." "On Thursday, as part of a large auction of antiquities, Christie's in New York plans to put up for bid a mummy and its sarcophagus that date back to around 990-940 BC. The sarcophagus, made of fig wood, comes from a period when both the insides and outsides of these burial containers were elaborately painted or sculpted. Ancient Egyptians were known for their lavish tombs, with beautiful scenes on the walls. But grave robbing was already prevalent by 1000 BC, and so the scenes moved from the wall to the sarcophagus, which was often hidden in a cache in a temple. The auction house has made no public estimate of how much they expect it to bring, although the last time a mummy was sold at auction was in May 2003, when Christie's in England set a record of $1.4 million. Max Bernheimer, the head of the antiquities department at Christie's, said that this sarcophagus is in better shape and that the house is confident it will go for more than $1.5 million." "The Walters Art Museum presents the exhibit Daily Magic in Ancient Egypt through November 18, 2007. Magic played an important role in religions of the ancient world. Amulets in particular were believed to posess great power to bring protection, health, luck, and even immortality through their images and symbols. This small exhibition will feature 46 amulets, scarabs, figurines, and ritual objects associated with this belief in the power of magic in ancient Egypt." "Bulldozers have moved in to demolish houses in the Egyptian village of Qurna which sits on top of dozens of pharaonic tombs in Luxor. The Egyptian government is determined to move the 3,200 families of the village to an alternative settlement it has built a few kilometres away. Officials say emptying out the village will enable them to explore the tombs and to protect them from water damage. An official ceremony was held and the bulldozers moved in. They demolished four uninhabited mud brick houses in the village of Qurna, very near the Valley of the Kings in Luxor. Many villagers have already left to the new settlement of Taref built by the Egyptian government at a cost of $31m (£15.6m)." No new information, but there is a photo of the robot on this page. "Visitors to the Segedunum Roman Fort in Wallsend will come face to face with an ancient Egyptian mummy this week, as a 3-dimensional digital image of her head is put on display at the Museum for the first time. The mummy, known as Bakt Hor Nekht, has never been seen before; her intricately decorated coffin sealed out of respect and to preserve her remains. However, a CT scan carried out by Newcastle General Hospital this summer has now been used to create an accurate, detailed digital reconstruction of her head." See the above page for the full story, with photos of the CT scans. "Scholars have long believed that ancient Egypt was a genetic stew of ethnicity, as the fabled kingdom was both a center of international trade and often the victim of foreign invasions. Now, new evidence suggests that may have been true even in the upper echelons of society, according to researchers who have used a blend of art and science to re-create what the ancients looked like in real life. They have used CAT scans to model the skulls of seven mummies from various museums, including one unveiled yesterday at Philadelphia's Academy of Natural Sciences, revealing physical features that range from Mediterranean to African. . . . He cautioned against drawing firm conclusions from such a small sample, and he stressed that ethnic traits were a small part of his research. But he said the findings suggested a society where race had little to do with class." "Drawing on the well-established mythos of three distinct cultures, Ensemble have created a real-time strategy game that is not too radical a departure for RTS traditionalists, but is at the same time innovative enough to keep things fresh and compete with releases like Warcraft 3. There are three main civilizations to choose from - Greek, Egyptian, and Norse. Each of these may pick one major deity from the pantheon as a patron, and this determines certain abilities and units available to the player." "An interstellar teleportation device, found in Egypt, leads to a planet with humans resembling ancient Egyptians who worship the god Ra. It will take you a million light years from home. But will it bring you back? It's a question often pondered by passengers on certain airlines nowadays … With the new season (the third) of Stargate Atlantis, we are, basically, nipping at the heels of what's going down in the plot in the US (we've almost caught up, in fact)." "In new research on the Great Pyramids of Giza, a scientist says he has found more to their construction than cut natural limestone. Some original parts of the massive structures appear to be made of concrete blocks.If true, historians say, this would be the earliest known application of concrete technology, some 2,500 years before the Romans started using it widely in harbors, amphitheaters and other architecture.Reporting the results of his study, Michel W. Barsoum, a professor of materials engineering at Drexel University, in Philadelphia, concluded that the use of limestone concrete could explain in part how the Egyptians were able to complete such massive monuments, beginning around 2550 B. C. They used concrete blocks, he said, on the outer and inner casings and probably on the upper levels, where it would have been difficult to hoist carved stone." See the above page for the full story. If you are asked for a username and password, use egyptnews in both fields. "According to a French science magazine called "Science and Life", scientists have noticed the difference between the stones in pyramids and stones in stone quarries. Drexel University Professor Michel Barsoum and France National Aviation Research Office manager Gilles Hug told that there are distnictive differences between the stones of Giza Pyramids and the stones in the quarries which were thought to be the source of the stones. Researchers think that the stones in pyramids are geo-polymer based synthetics." This article looks at some of the arguments for and against: "Opponents of the theory dispute the scientific evidence. They also say that the diverse shapes of the stones show that moulds were not used. They add that a huge amount of limestone chalk and burnt wood would have been needed to make the concrete, while the Egyptians had the manpower to hoist all the natural stone they wanted. The concrete theorists say that they will be unable to prove their theory conclusively until the Egyptian authorities give them access to substantial samples." This is the complete item on the SIS website. "On Saturday, 3,200 families from Al-Gourna will be relocated to the Al-Taref city on Luxor's outskirts. They will be leaving their hometown to explorers who are bent upon unearthing not less than 100 ancient Egyptian tombs expected to be found there." "A robot archaeologist is to be sent deep inside Egypt's largest pyramid in a bid to solve secrets revealed by a first foray more than four years ago, antiquities supremo Zahi Hawass said. . . . Teams from Egypt and Singapore and a joint group from Britain and Hong Kong plan to insert the robot in February inside the Pyramid of Cheops at Giza, near to Cairo." The robot will be sent down narrow passages in the Queen's Chamber. See the above page for the full story. The 'Instituto de Estudios del Antiguo Egipto' (I.E.A.E.) has updated its Senenmut website with the 2006 dig diary, in Spanish. The diary covers the period from the 27th October to the 17th of December 2006: "Observando las fotografías de las campañas de Winlock de 1926 y 27, observamos ciertas discrepancias en cuanto a los planos que nos proporciona la documentación que estamos consultando sobre el área, por lo que hemos decidido, ya que vamos a realizar un nuevo alzado topográfico de zona, realizar una serie de comprobaciones antes de continuar". The second link shows images of the excavation.